Having worked over the past decade on tour with an impressive list of entertainers such as Tom Jones, Elton John, Rod Stewart, and Kenny G, Simon Greaves has extensive experience in live event production. 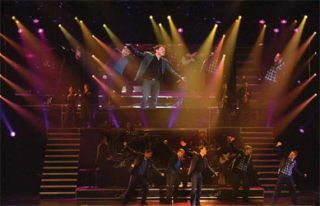 Most recently Greaves has concentrated on assisting entertainer Donny Osmond to create a custom live production system that can control multiple screens independently and affordably. As live events video director for Las Vegas, NV-based Tours by Sloan, Simon Greaves has been directing the Donny & Marie Variety Show at the Flamingo Hotel and Casino since September 1. live events video director for Las Vegas, NV-based Tours by Sloan, Greaves has been directing the Donny & Marie Variety Show at the Flamingo Hotel and Casino since September 1. The show attempts to bring variety back to Vegas. Donny & Marie Osmond have deliberately chosen to perform numbers reflecting diverse past and present musical influences from the 1940s to present day. The chosen venue, Las Vegas’ Flamingo Hotel and Casino, presented several challenges to set design, set changes, and choreography. Lighting director Butch Allen designed the three-screen LED set. Director/choreographer Barry Lather provided the show design. The old-style showroom, smaller stage, and low proscenium meant that all equipment and stage decoration had to fit together precisely. A primary goal for the show was the ability to split a single image across three LED screens on stage and then send two additional separate feeds to projection screens with IMAG images. In this way, each screen can show a different closeup shot, such as a picture of Marie on one screen and Donny on the other. The old style showroom, smaller stage, and low proscenium, meant that all equipment and stage decoration had to fit together precisely. A primary goal for the show was the ability to split a single image across three LED screens on stage and then send two additional separate feeds to projection screens with IMAG images. QuickTime or MPEG files can be placed into a folder and then located from within the switcher for instant, one-click access. According to Greaves, the compact yet powerful design of the Slate 5016 offered additional benefits for the show at the Flamingo. Two additional shows take place at the Flamingo Hotel and Casino on the same day as the Donny & Marie Show, making for tight quarters backstage. The Broadcast Pix built-in multi-viewer reduces the overall equipment footprint, which is essential in the Flamingo’s relatively small theater. “We were pleased with the way the Slate 5016 provided a multi-viewer so that we could keep our footprint small and reduce the monitoring needed. It helped us blend in beautifully backstage,” adds Greaves. Creative Technology Los Angeles provided 72 panels of Ilite 8mm Barco LED, two Sony D55 cameras, and two Panasonic AWE800 remote cameras. Las Vegas-based SPGS provided the wall motion. Donny Osmond maintains a hands-on technical relationship with his technical crew. All video clips played during the show were created by Osmond at HQ Media in Salt Lake City. Osmond and Greaves custom-built the playback system based around four PCs with Decklink HD cards running Neuendo’s Cubase LE, all controlled by MIDI triggers supplied from an Apple Mac running Steinberg Neuendo 4, a basic Master and Slave setup. A software program called Fresco, developed by Bruce Wheaton of Spear Morgan, supports the multiple switching. Fresco allows Greaves to build modules, which, on a single MIDI trigger, can switch all five screens to different router inputs. Modifications to the system were recently made so it could receive multiple MIDI signals, allowing Neuendo to control the screen switches automatically all while still retaining a seamless manual back-up. To better integrate with the Flamingo’s in-house AV system, the decision was made to process video signals in standard definition. If the Flamingo upgrades to HD, the Slate 5016 will be fully compatible. An established L’Acoustics Kudo serves as the primary audio system. A Digico D5 is at the front of house and a Yamaha PM5D sits at monitors. Given the quality level currently in place, there was no need to change the existing equipment. Prior to the show’s moving to the Flamingo, a complete Sennheiser G2 RF ear monitor package as well as Shure hardwire units for keys and drums were added. Virtually every microphone on stage is from Audio Technica. Peter Morse designed the show’s lighting, which was programmed by Arnold Serame. Operator Joseph Eddy uses a GrandMA and GrandMA Lite as a backup to drive 12 universes routed thru three MA-lighting NSP’s. The lighting rig uses over 160 moving lights, including VL 3000’s, Mac 2000 wash, Mac 2000 Profiles, and Mac 700’s. For set lighting, Color Kenetics color blast 12’s are used, while two DF-50 Hazers, two ZR-33 smoke machines, and a G-300 with cold flow for low lying fog add to the atmosphere. The video system design in place at the Donny & Marie Show is a demonstration of how the touring market is focusing on reducing costs without reducing quality. The Broadcast Pix Slate system provides a 2ME switcher setup in two 24U road cases and one plasma screen. It represents a significant saving on space and weight over a conventional switcher.